Following an ancient recording from Galileo Galilei uncovered in 1960s London, the Doctor, Liv, and Helen travel to Renaissance Florence to discover the truth behind the mysterious summoning. As a new plague and a ferocious beast ravage the city with Galileo imprisoned in his villa for heresy, one final secret may be the Earth’s most important in ‘The Galileo Trap’ by Marc Platt. Though the story is steeped in history, these elements are very much used to enrich the plot rather than to serve as the sole focus. Thus, while Galileo is here presented in exile from both the public and the Church because of his fantastic theory that the Earth must circle around the Sun rather than vice versa, this historical fact serves to explain why he is so reticent to tell anybody that he has discovered a new planet sitting between the Sun and Mercury, one that burns so brightly that he can no longer see as a result. With this historical figure, Platt achieves the difficult task of showing rather than simply discussing his genius, and it’s clear throughout that Galileo is far more cunning than might be expected as his complicated motivations become known and he proves willing to betray his genuine friendship with the Doctor to retain a modicum of a normal family life even though he knows his daughter is anything but. This role requires a commanding voice capable of both bombast and humility, and John Woodvine shines while bringing this complex individual to life in a realistic and well-rounded manner. 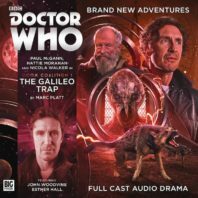 Compared to recent stories, ‘The Galileo Trap’ has a fairly minimal plot as two alien mercenaries have entwined themselves in Renaissance times to await the Doctor’s next visit as has been orchestrated. Yet although it’s not surprising that the Doctor should choose to willingly walk into a trap both for this story and to confront the Eleven in the next after gaining specific knowledge here, it does also put ‘The Galileo Trap’ in something of a superfluous position since the end outcome would have been the same regardless of the Doctor vanquishing his foes or not. Still, even though the mercenary Cleaver sometimes veers into over the top territory, the plot as it is that comes into greater prominence in the second half of the tale does effectively lead into the finale, but it simply doesn’t compare to the wonderful atmosphere the slower pacing of the first half provides as Florence so vividly comes to life. Given that this is Helen’s first foray into history, it’s perhaps unsurprising that she takes more of a secondary role here while she comes to terms with the wonderful new world and opportunity that have opened up around her. Though she is fortunate to find herself traveling with the Doctor at a time when he is unafraid to help those in need even if it means introducing an anachronism as he allows for the use of antiseptic ointment, she nonetheless appears grateful to have the more experienced Liv as something of a mentor to explain to her how best to manage the Doctor and how to avoid drawing unwanted attention. There’s already a wonderful chemistry forming among this new trio, and although the Doctor rightfully offers Helen the chance to stay behind given the inevitable danger that will ensue, it’s a genuine relief that she declines and will hopefully become increasingly developed and involved as her tenure in the TARDIS continues following a promising beginning.